There are 347 million people who fight diabetes in the world, with burdens varying from high costs to fatal complications. It is a self-management disease and you can’t manage what you can’t see. There are over 10 million diabetics in the USA alone who do not own a smartphone but have a normal mobile phone. Furthermore, almost 80% of deaths due to to diabetes occurs in developing countries, where smartphone penetration is far less. 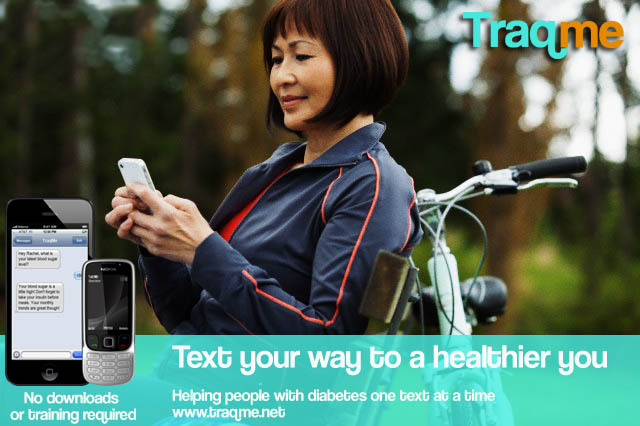 Using text messaging to help diabetics focus on the things they love in life, Traq Me provides powerful insights from the daily glucose measurements to patients and caregivers. By text messages the app reminds them to measure blood sugar and capture the values. The inventors of Traq Me transform these measurements into insights and provide them in mobile and responsive forms. Traq Me thereby does not require any Appstore downloads, expensive bluetooth devices or even owning a smartphone! The patient receives an SMS reminder to measure their glucose and they text it as a reply. TraqMe then responds with 3-day, weekly and monthly trends. The patient’s family can then follow the progress no matter where they are and know what is happening with their loved ones, regardless of location and time zone. When the doctor’s follow-up day comes, the patient would have easily created a complete graph of historical measurements, which the doctor can use to assess the progress and adjust medications. TraqMe users can communicate with others in their local area to share ideas, educational videos and create group events. The campaign’s goal is $5,000 and ends on June 13.